Very convenient. I have 3 dogs and this can still keep up with all the hair. The battery lasts a long tim. I prefer this over a standard vacuum because of th convenience and ease of use. It’s also great for getting cobwebs off of ceiling vents. The IONFlex is powerful and yet lightweight. It also takes a small footprint of storage space. I had a Dyson which had the nice feature of hanging and charging on a wall dock, but can't compare with Shark's cleaning power and 2 batteries! I love this vacuum.I have to use a walker which makes vacuuming tricky. This is so light I can easily place it on the seat of my walker to get it to the room I need to vacuum. It is just as strong as my corded vacuums. The 2 batteries are a must especially since they don't last all that long. I like the fact that it folds in half since it's easier to move that way and less obtrusive when you leave it out (which is most of the time in my case). Love this machine! So handy and powerful and fun to use. It's everything it says in the description. Does not disappoint. My friend just got the Dyson and I bought this one. I love it so much more than hers. I love that it will flex and go under furniture and am really impressed with the amount of suction it has. We are pet owners so this is a must have. Had a Dyson animal cordless vac that had to be replaced after battery stopped holding a charge. Saw the great reviews of this Shark cordless vac and thought I'd try this brand out for a change. What drew me to this cordless vac is the power and 2 batteries plus charger it came with. When I need a fast touch-up of the downstairs, I don't want to drag my Dyson corded vac around. The Shark battery lasts long enough for me to vac all throw rugs, hardwood floors and get around all the nooks and crannies of furniture and laundry room with ease. It has great flexibility and the soft roller on the stick vac head is wonderful for hardwood floors...gentle but very thorough. I've had back surgery in the past and I did notice the heft of this vac is more than my old Dyson, but not enough to deter me from purchasing/keeping. Would definitely choose to purchase through Overstock since I have a Club O Gold Membership (worth it), get free shipping, 5% rewards to use on future purchases and ebates cash back. Can't beat the deal!!! I really like this vacuum. The light weight is the main reason and not having to deal with a cord. I have a full size corded Shark Navigator but have severe back issues. I’m giving it to my daughter. She and her family have a two story house and will appreciate it’s many features. 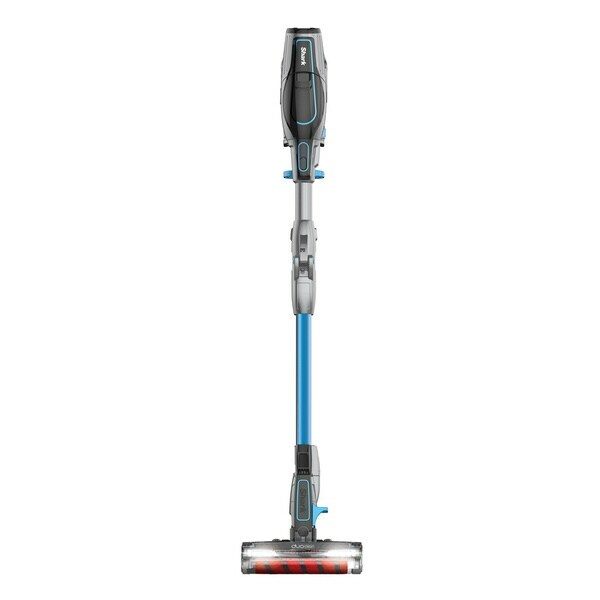 This ion flex duo clean cordless stick vacuum will work best in my small apartment on a combination of wood floors and area rugs. Great buy! I have admired the features of this Vacuum,for some time.This amazing machine, is ,bagless,cordless,and very powerful.Since this hard working machine, comes with an extra battery,one can charge while you clean,so the cleaning can be done quicker. Wow!! The IONFlex Cordless Vacuum is by far superior to it's competition!! It has a powerful suction on even the lowest setting. The attachments are definitely a plus to have and the extra battery is so convenient to have! It can reach into all of my "hard to get to" places with ease and doesn't take up much room in my broom closet when stored away! If you're on the fence quit procrastinating and order one!! You will be so happy you did!! We have a larger Shark vacuum. But we needed a lighter version that would make cleaning stairs a breeze. This Shark meets that demand and more. I have had other battery operated cleaners and was a little apprehensive of getting another one due to lack of suction and battery life. But this little Shark has not disappointed in either concern. The agility of it has proven to be quite handy to reach around and under furniture. The included accessories make cleaning a variety of heights​ and surfaces easy. It looks very attractive. It's a lot of work to use - as it won't stand up without leaning it on something. I do not necessarily care for the way it detaches from the stick to empty. I don't care for how heavy the stick is if you want to reach for a cobweb above. Batteries don't last long - definitely not great on rugs - but amazing if all you have is hard woods or a hard surface to vac. This would be a great addition to a larger vac if you had multi surfaces - but seems too expensive for that. In retrospect, I would only purchase if I had no carpets or large rugs. Can't say enough good things about this vacuum. good suction on both hardwood and carpeted floors. Great for getting under furniture, ceilings, vents, etc. Highly recommend this vacuum cleaner. good price too. This vacuum has changed my life. It is light so no dragging a heavy vacuum. No cord so you don’t get half way through a room and come to the end of a cord. I like to vacuum now. It is powerful and quieter than my old vacuum. Yes I would recommend this. It’s easy to maneuver and works on carpet and floors equally. "Are batteries available for purchase should I need to down the line replace one or both original batteries?" Great reviews. Recently saw advertised on TV and thought it would replace my cordless Dyson that no longer charges. The Shark IONFlex has 2 batteries so you can use one to vacuum while you charge the other. Nice price with coupon and Overstock rewards points for shopping plus free shipping. "Does this model IF251 have 2 batteries?"